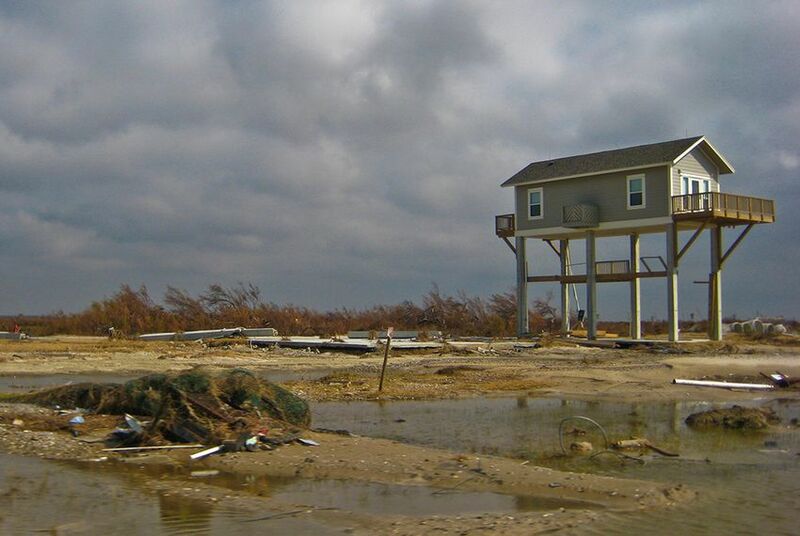 Galveston is still recovering from Hurricane Ike in 2008. Dilapidated homes and empty lots dot the streets. Nearly six years after the storm, though, lawmakers continue to grapple with preparation for the next big one. GALVESTON — Nearly six years after Hurricane Ike, one of the nation’s deadliest hurricanes, struck this city, boarded-up and dilapidated houses and empty lots still punctuate the streets. Many houses that remain are decorated with “for sale” signs. “This was a thriving neighborhood,” Tina Kolunga said as she drove down a street lined with abandoned houses. On another street, she pointed out large patches of grass where homes and public housing used to sit. Kolunga still lives in Galveston, though she struggled for years after Ike to rebuild her home. “This used to be one of the busiest restaurants in town,” Kolunga said, pointing out a rundown white building still worn from water damage. As Kolunga toured the damage that remains years after Ike, recounting the ongoing recovery struggles of her neighbors, state lawmakers across town worried about the future of this coastal town and the surrounding region. At a hearing of the Joint Interim Committee to Study a Coastal Barrier System, held just a few miles from Kolunga's neighborhood, on Texas A&M University's Galveston campus Monday, experts told legislators that the coast is still not adequately prepared for a hurricane like Ike, which in September 2008 left billions of dollars of damage and at least 100 people dead in its wake. Since 2009, less than half of the $3.1 billion the federal government allocated to Texas for rebuilding efforts after Ike has been spent. That’s an improvement since 2011, when less than 20 percent of the funds were spent and two different state agencies were leading recovery efforts. That summer, the General Land Office took control, and 45 percent of the money has been spent. But the going remains slow — particularly for those most in need. Initially, money for damaged housing went primarily to owners of single-family homes. After advocacy groups cried foul, the state agreed that a second round of funding — close to half a million dollars — would mostly be used for rental properties, where poorer residents tend to live. Only about 3 percent of that funding has been spent so far, according to the General Land Office. Katy Sellers, a spokeswoman for the General Land Office’s disaster recovery program, said the numbers may be skewed. Expenditures are only recorded after construction is finished. In future months, the spending figures will increase dramatically because a lot of construction has been completed, she said. The bureaucracy has caused many residents to give up, community advocates in Galveston said. Unable to navigate mounds of paperwork and the prospect of higher insurance rates, some have abandoned their homes or lost them to foreclosure. Census data shows that Galveston has lost thousands of African-American residents since 2008. As the community struggles to keep its remaining residents, and as yet another hurricane season approaches, debate continues over how the region should protect itself from another storm. “Are we ready for the next storm?” state Rep. Armando Walle, D-Houston, asked during the legislative hearing Monday, noting that since 1980, Texas’ Gulf Coast has experienced 19 significant storms that occurred during the month of August. The answer from Jim Blackburn, an environmental lawyer from Houston who also directs the Severe Storm Prediction, Education, and Evacuation from Disasters Center at Rice University, was no. “We’re not protected. We are extremely vulnerable,” Blackburn said. Unlike Louisiana and New York after Hurricanes Katrina and Sandy, Texas never developed a comprehensive plan to protect its coast. In 2008, when Ike hit Texas, Congress was grappling with the financial crisis, and the state didn’t seek the same volume of federal funding to implement a plan. Researchers and government engineers told lawmakers about studies underway to protect the Texas coast and identify vulnerable infrastructure, but they were not satisfied. “We don’t have a plan,” said state Rep. Greg Bonnen, R-Friendswood. Part of the challenge for experts working on coastal resiliency plans has been identifying the most important areas that should be protected in what is likely to be a multibillion-dollar effort, requiring both massive infrastructure and years of planning. Setting those priorities could mean leaving other areas behind. Researchers at Texas A&M University have proposed a so-called Ike Dike, a large seawall-type barrier or gate that would span all of Galveston Bay, along with extending a seawall on Galveston Island across the Bolivar Peninsula. But critics say that solution could cut off Galveston Bay from salty sea water that allows oysters and other species to thrive. It could also choke the migration of the lucrative species that fishermen catch in the bay. Blackburn and his colleagues at Rice University recently proposed an alternative known as the “Centennial Gate” that would be much narrower in scope and wouldn’t span the entire bay. Legislators urged researchers to come to a consensus on a coastal protection plan before it is too late. Tony Williams, an environmental review coordinator at the General Land Office, told lawmakers that while some of the plans may be controversial, it is imperative that protections are implemented soon. "People are going to ask, 'Why are you protecting this person and not me?'" But, he warned, if nothing is done, "people will say, 'Why did you not protect me when you had the opportunity?'"